Tom Volpe and his wife Cecilia are both artists in their own regard. Tom is a sculptor and Cecilia paints. After spending 33 years in finance, Thomas Volpe wanted to stay busy during his retirement. The 78-year-old Darien resident began by volunteering. 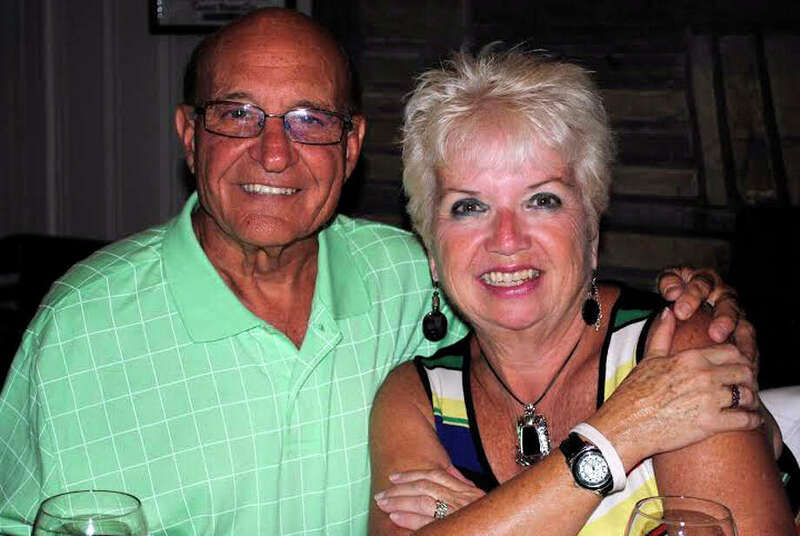 "A position opened up on the Darien Board of Finance, which I applied for, and was appointed to fill," said Volpe, who has lived in town for 38 years. Volpe served 10 years with the Board of Finance, and also was on the Town Pension and Police Pension committees, deliberating on the new high school, Tokeneke Elementary School and the library. But Volpe also wanted to try his hand at sculpting. "When I retired, I also wanted to pursue my interest in art, something that I could never do while I was employed," he said. 15 minutes north in New Canaan's Waveny Park. The studio, which is housed in the Carriage Barn Arts Center on the property, provides a second home for 20 other sculptors and instructors. It was there that Volpe started working -- enthusiastically, he said -- and experimenting with various mediums in his sculptures. "I started in water-based clay, then oil-based clay, carved marble and alabaster," Volpe said. "I made large plaster casts; a Greek-like torso and a 4-foot ballerina. I had four of my sculptures cast in bronze." Volpe, who's had an artistic nature since childhood when he frequently sketched, didn't try his hand at sculpting until years before he retired. He bought a home sculpting kit that could be fired in the kitchen oven to try his first sculpture. "I worked on it and worked on it," said Volpe, who was still employed as the vice president of tax affairs at Champion International Corp. "I had a real interest in sculpting and I had worked on it so long. When I finally got it done, I was so thrilled with it." Volpe finished his sculpture of a baby one winter night and left the clay sculpture out to dry before firing it the next morning. However, come morning, the sculpture had dried too quickly and pieces of it had fallen off and cracked. "I just wasn't knowledgeable about how to protect (the sculpture) and let it dry slowly," Volpe said. Volpe's time spent in the Carriage Barn isn't just a hobby. His work has been featured in shows in Connecticut and in Westchester County, N.Y., and he's won many blue ribbons for his work, though he doesn't sell it. Volpe is not the only one in his Pasture Lane house with an eye for art. Cecilia, his wife of 28 years, is an acrylic and watercolor painter. "Our house has become somewhat of an art gallery," Volpe said. After he retired, Volpe again set to work on sculpting a baby in the arms of an adult figure. "I wasn't very experienced, but it was coming along very good," Volpe said. "I had trouble making the features of the baby because they're all so different and round and their head is so big." Nevertheless, Volpe entered the final product in a local show and came home with a prize, though he can't remember if it was second place or honorable mention. "I had somebody once comment on it that it was so cute and that it looked like Winston Churchill," Volpe said with a laugh. Volpe's second piece -- "Best Friends" -- was inspired by Victoria and Heather Volpe, of Monroe, his oldest granddaughters. The sculpture is of two young girls with their arms around each other. The older of the two girls has her arm behind her back with her hand slightly opened. When Volpe shows the piece at exhibits, he's sure to place fresh wildflowers in the open hand. During the winter months, Volpe and his wife retreat to their Sarasota, Fla., home, but when he is home in Darien, he can be found at Waveny Park every Friday with fellow sculptors. The Volpes frequently visit museums and galleries to learn more about art. The three-dimensional aspect of sculpture is what interests Volpe. "I work a lot with my hands and I really feel like I'm creating a piece of art," Volpe said. "When you're all finished, it's almost alive."